I had to hold this post until they have the Huda Beauty Rose Gold Palette back in stock. Also I’m just going to take a minute and pray that it doesn’t get sold out by the time I do end up putting this up. A review has to be an honest opinion and in all honesty I love and adore this palette. It’s everything that I needed in a palette. 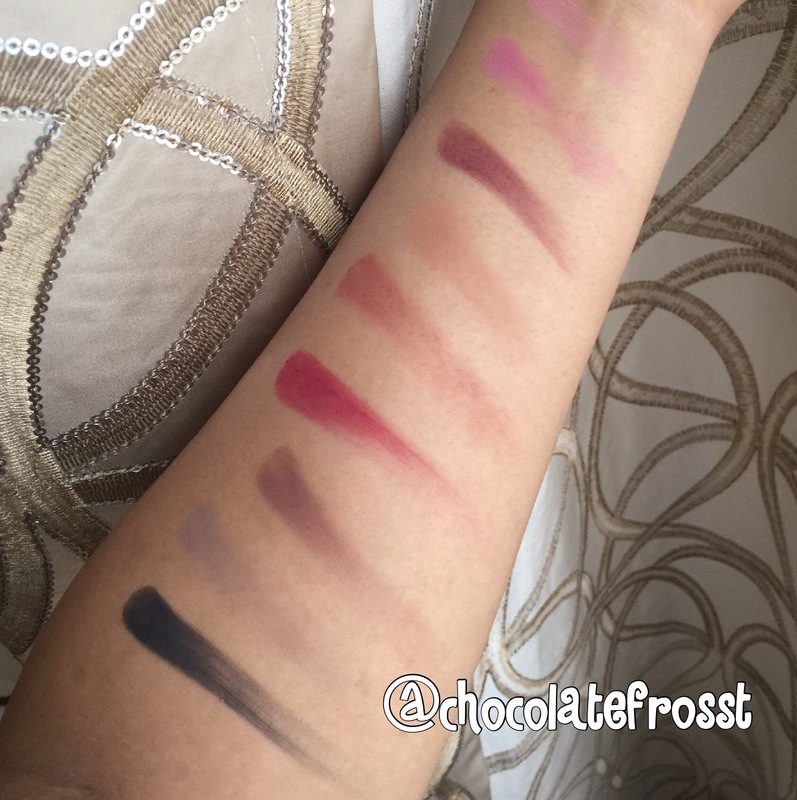 Unlike their liquid lipsticks this palette nailed it with me with absolutely no qualms. I know this has been a controversial palette with mixed reviews and criticism over packaging and price point. However let me explain why I love it and why I think perhaps it’s not everyone’s cup of tea at the same time. Retailing at $65 this palette is a splurge. The packaging itself is a very basic plastic palette with a clear top. 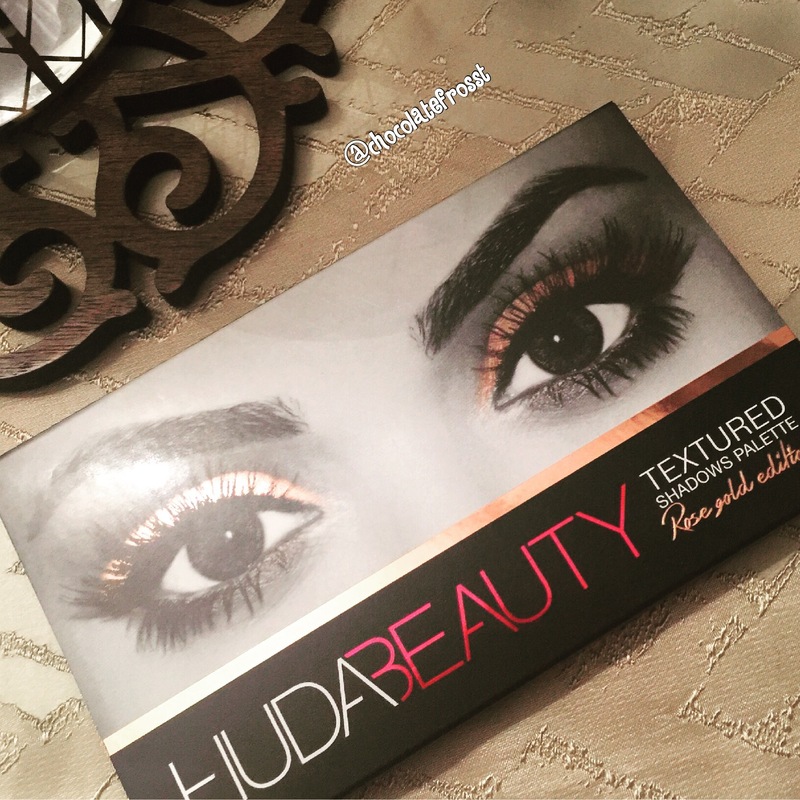 The Huda beauty signature eyes in a dual effect cardboard casing does come covering the palette. To be honest you’d expect a better packaging considering its price point and rightfully so. Also the cardboard casing is something that in practically terms won’t last and I really wish it was on the plastic casing top instead because it’s super pretty and I want to have it permanent and hassle free part of the packaging. I love this palette. It has to be one perfect palette and has all the perfect colors I have been looking for lately. Since the day I got it I haven’t been able to put it down. The colors are so versatile and there’s so many looks that you can go for with it. 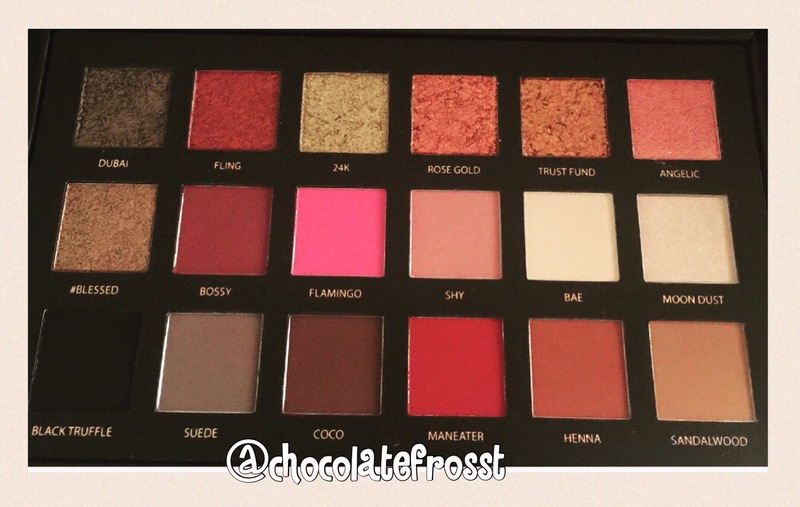 However having said that I can understand why this palette had mixed reviews and why some people don’t like it. I mean anything and everything is subject to tastes and preferences at the end of the day. This is a very warm toned palette with some strong reds and pinks. Everytime I look at it i see it as a palette for someone who loves experimenting, uses very warm bright colors and someone who loves the shine and bling. So for anyone who’s more into very subtle or monotonous shades and looks this palette can be overwhelming. There is 18 shades in the palette including 6 foiled, 2 frosted and 10 matte shades. It’s very hard to find a palette in which you like all the colors and use them all but this is one such palette for me. The shadows are buttery enough and blends beautifully. They are highly pigmented and the color pay-off it amazing. I usually start with less and build up to my desired level. The foiled shadows give best results when used with fingers and they are gorgeous. 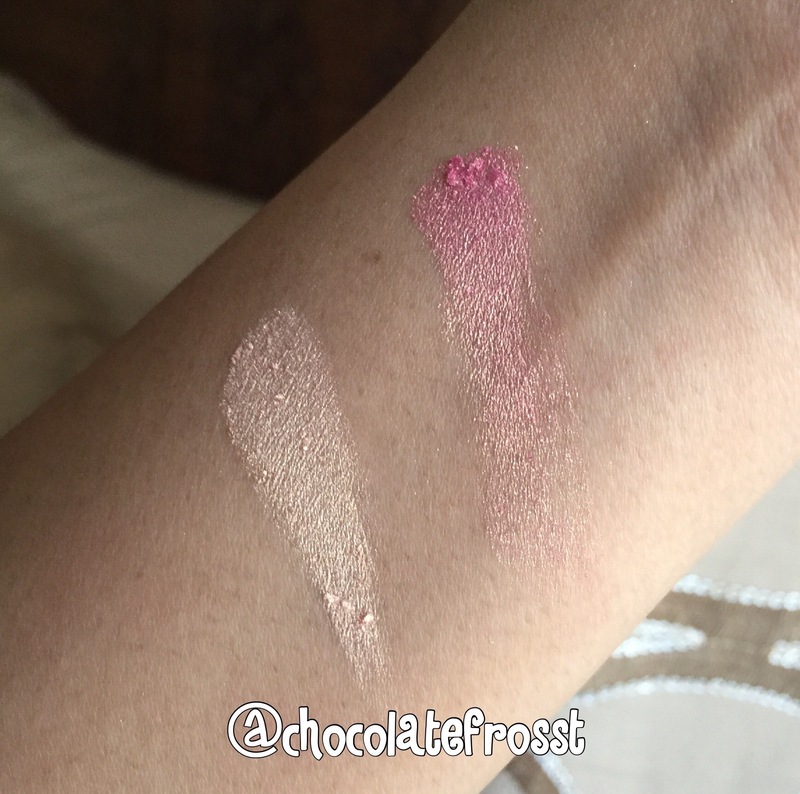 I love how the two frosted eyeshadows glow with a lovely sheen-like finish. Honestly, I don’t have much else to say about this palette except that i love it and have made 101% use of it ever since I got it.It has made my eye makeup time shorter by just making like easier with all the incredible color palette they have. The shades are amazing with ‘desi’ clothes and more everyday high street fashion and caters to any kind of eye look you would want to go for; subtle or over-the-top or somewhere in between. 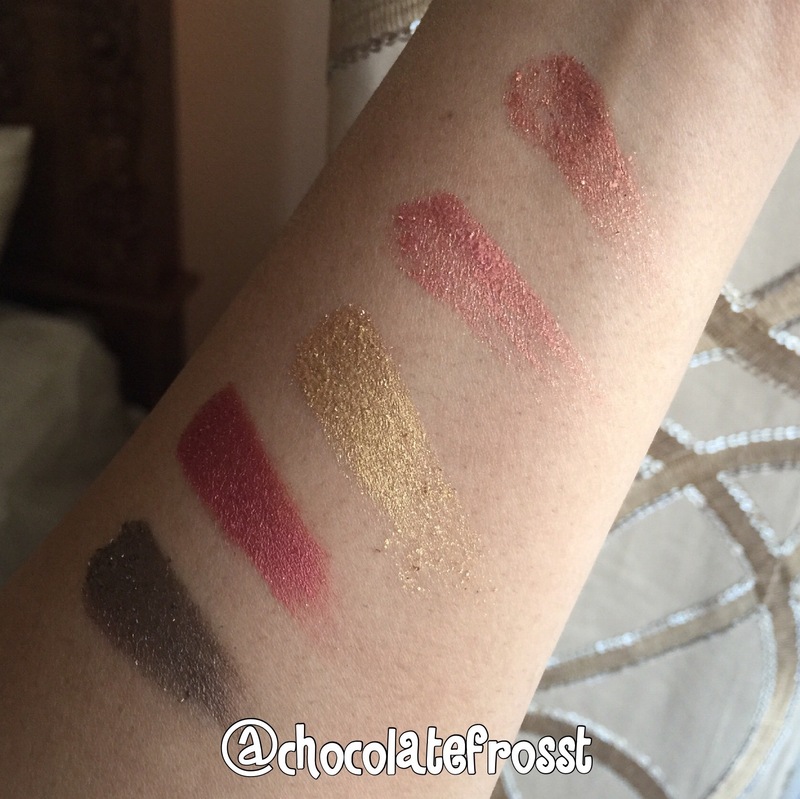 Left to Right : ‘Dubai’ ,’Fling’, ’24K’, ‘Rose Gold’ and ‘Trusted Fund’. **P.s: I forgot to swatch ‘blessed’ *eeks* but ill get back to it soon. Left to Right: ‘Black Truffle’, ‘Seude’, ‘Coco’, ‘Maneater’, ‘Henna’ and ‘Sandalwood’, ‘Bossy, ‘Flamingo’,’Shy’ and ‘Bae(doesn’t really show on my skin). I like the clear lid – you can see the colours easily! And those foil shadows look amazing! I like that too, it’s simple and effective but then I want the pretty eyes to be part of it too😅😅 Basically I’m being greedy😂😂 . The foils are seriously really good, so gorgeous on the lids. 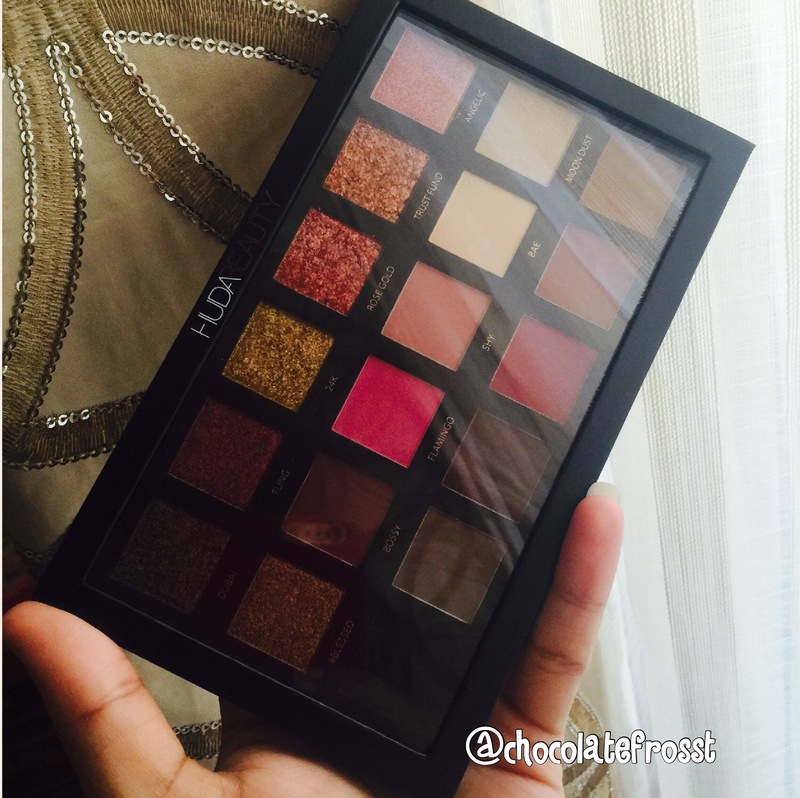 hmm I had not seen this around nor have I tried HUDA before but the pigmentation looks very promising on these. It has some similarities with the modern renaissance. This is a good contender. Thanks for sharing! The modern Renaissance palette is often compared to this one, because apart from the foils the colors are pretty similar. 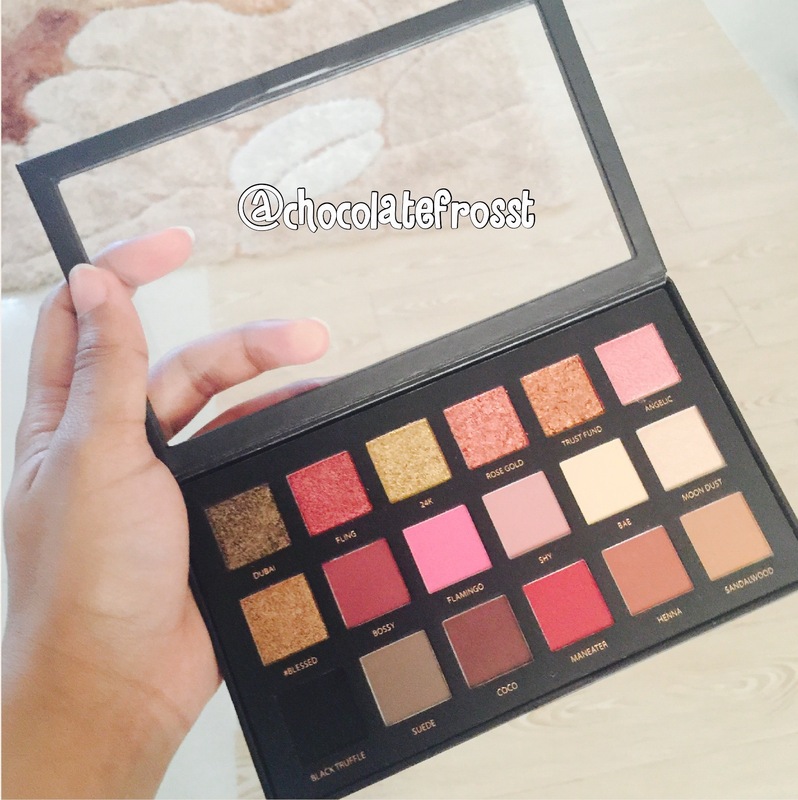 I love their pigmentation and I would recommend checking HUDA stuff out they are good. She’s coming out with a highlighter palette and foundations soon too. I paid NZD $101 for the palette 🙊 lol. I absolutely love the palette aswel. The colours are just so vivid and amazing. Back to the world of Cartoons and Colors! Chanel Hydra Beauty Nutrition Review |Does your skin need to go designer?